When I think about the NWOBHM’s bands, I really have a sad feeling. This is born from an idea that we didn’t know all the bands from those days, and the greater names of the movement can’t be the best ones. There are some names that could be greater as IRON MAIDEN, DEF LEPPARD or SAXON, due their excellent works. But no name can fit as an example as I say better than BLITZKRIEG. They were an amazing and creative Heavy Metal band on the first part of the 80s, but due the lack of interest from labels, their first album only came to the light on 1985. I truly recommend the young ones to hear their works, especially their EP “Reign of Fire” that is out now. On their music, you’ll feel the essence of NWOBHM pulsing alive and strong, with very good melodies and the right dose of aggressiveness. The songs are full of energy, with a fine and aggressive work on the instrumental parts (a particular feature from the band) along with great vocals (done by the band leader, the notorious vocalist Brain Ross). Pay attention, because it’s a class about how playing Old School Heavy Metal with a modern outfit. The sonority of “Reign of Fire” is clear and heavy, with some points where the distortion becomes aggressive. But the clarity of the instrumental tunes fits perfectly on the band’s musical work, and all the things are in their due places, making things easy to understand for the listener. These two songs are perfect jewels from what NWOBHM is about. 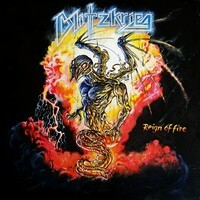 On “Reign of Fire” you will receive a powerful and melodic blow from their guitars, with charming solos and great riffs. “Judge Not” is an exclusive track for this vinyl release, showing a very good mix between aggressiveness and melodies, with a heavy work from bass guitar and drums. Oh, I don’t need to speak about Brian Ross’ voice, because he is an amazing singer, as you’ll hear on both songs. Listen to and buy this EP as soon as you can, because BLITZKRIEG deserves you full attention.